Big Burst targets made by industry leading Birchwood Casey are an excellent training tool to help you hone your accuracy. Birchwood's patented technology causes the bullet hole to explode in white color providing instant feedback to the shooter. 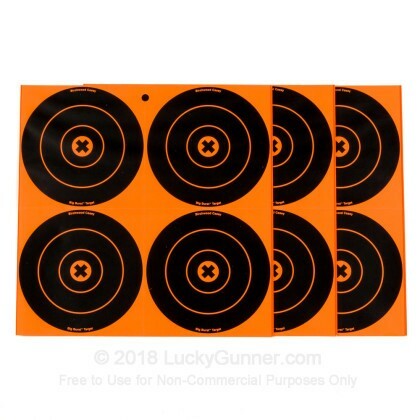 These targets are excellent for indoor ranges, especially at longer distances, where it is often difficult to see where the bullet entered the target with only dim lighting available. Each bullet that penetrates the target will leave a white burst to provide immediate feedback on your accuracy. These self-adhesive targets are easy to affix to any surface of your choice! This kit has 12-6" Targets. Good quality for the price, thanks for having everything I need to stay at the range. 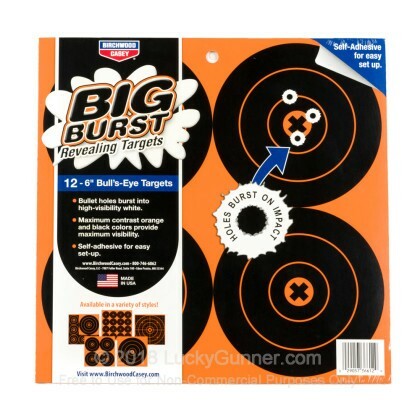 The targets perform fairly well but the "Big Burst" wasn't as big as expected. Very easy to see your shot placement even at longer distances. It's extremely visible! As someone else noted, it can get expensive if you shoot a lot. I was expecting 12 sheets, not 12 - six inch targets. It was my misunderstanding for sure, but still a little disappointing. I'd probably get them again, but for more specific practice; not general shooting. 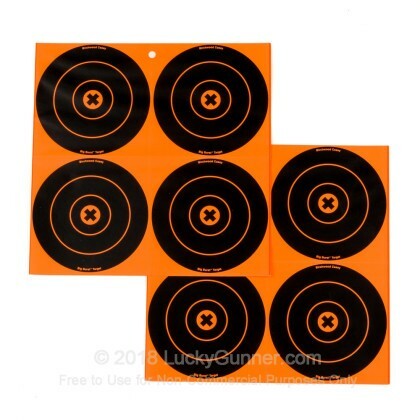 I use these targets at the gun range for anything over 30 ft eliminating the need for a spotter scope. The 9mm burst is easy to see at 30+ ft. I usually shoot life sized targets at 15-17 ft then apply Big Burst over my groupings then shoot at 30+ ft. Gives me the best of standard targets at close range and big burst targets at 30+ ft. I wholeheartedly recommend these peel-and-stick targets. Nice not looking through Binoculars! Great product but if you shoot a lot , it could get costly. Not bad but was a lil p/o that the medium size bulls arent seperate! You have to cut them out in order to use them individually.Maybe i had a bad set that didnt get press cut! Lucky Gunner is quickly becoming the premiere go to website for ammo related purchases. Truly the bang for the buck. I'm a cheaperthandirt convert and will stay with the Gunner for life.